Pharmacy Daily | WANT YOUR SKIN TO LOOK FLAWLESS? WANT YOUR SKIN TO LOOK FLAWLESS? 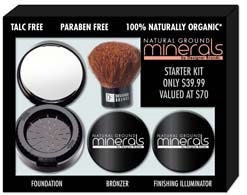 This week Pharmacy Daily is giving readers the chance to win an Natural Ground Minerals Starter Kit. 100% Naturally Organic, with an in-built no waste grinder so make-up is protected from light, air and bacteria. It also contains ingredients that care for your skin such as Poly Peptides & Pomegranate. Apart from a foundation there is a bronzer to give healthy, natural sun-kissed glow and a finishing Illuminator to set your make-up for an all day fresh finish. No nasties, no fuss application and suitable for even the most sensitive skin. A great way to start your Natural Minerals collection, everything you need is in this starter pack. What is the main ingredient of the Natural Ground Minerals? Make-up is protected from what 3 things? How many products are featured in the gift pack? What is the total value of the gift pack? The first correct entry received will win!